Another 2 more weekends to go. Time for a full dress rehearsal and so like the NDP, we did the rehearsal over 2 weekends. First up was the attire. I am normally a singlet and short guy but this time round after taking the recommendation of the race director and looking at the photos of the past 2 editions posted by Cornelius, I have opted to go for long sleeve and tights. And this is me modelling the attire that I will be wearing on race day. On the head is my trusty North Face cap given to me when I was volunteering with the North Face Singapore in the 2011 Trail Run series. I have contemplated getting one of those caps with a neck flap but I think I just have to apply a lot of sun block to protect the neck. The top is a Sugoi Titan Ice long sleeve t-shirt specially flown in from US just for the race. According to the Sugoi website, the material is infused with "icefilled" technology to keep runners cool in high temperature. And true to its claim, the shirt actually felt cooling when I was drenched with perspiration. The bottom is a Koar tight which I bought at Sundown Race Expo in May and cost me less than a $100 bucks. Not for me the 2XU or Skins which will cost an arm and a leg. Frankly I had never heard of Koar before but I figure since I am only going to wear it once, getting a cheap one was good enough. Fortunately, throughout the 7 hours that I had it on, it felt fine and there were no hot spots. On the feet will be a pair of Drymax socks. Now I perspire a lot when I run and usually by the time I finish my run, be it a 10km or more race, my socks and my shoes are all soaking wet. But with Drymax socks, I have been able to keep the shoe dry and that means my chances of getting blisters will be reduced. For good measure, I will also be bringing a spare pair of Wright double layer blister free socks. This will replace the Drymax if the socks become too wet after the river crossing. 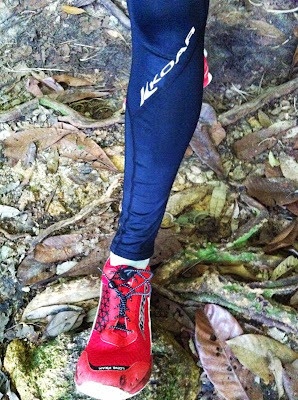 Over the socks will goes my latest addition, the bright red Altra Lone Peak 1.5. 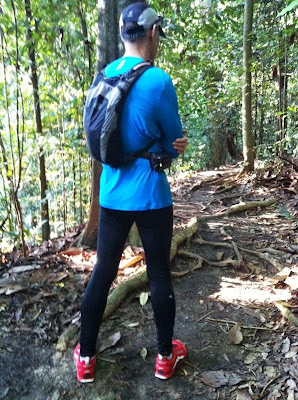 Todate I have worn it over 90 km or 18 hours of running and I must say this has got to be the best trail shoes I have. But more of the shoes in a another post.